Is PCD a reliable indicator of berry quality attributes in water stressed vineyards? Pons, J.; Serrano, L.; Gonzalez, C.; Gorchs, G.
Pons, J. [et al.]. 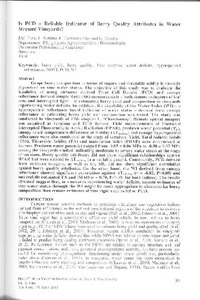 Is PCD a reliable indicator of berry quality attributes in water stressed vineyards?. A: International Workshop on Vineyard Mechanization and Grape and Wine Quality. "I International Workshop on Vineyard Mechanization and Grape and Wine Quality". Piacenza: 2012.